Visit Alta Badia for ski touring, wine safaris, a 7 km toboggan run, World Cup events and traditional mountain architecture. 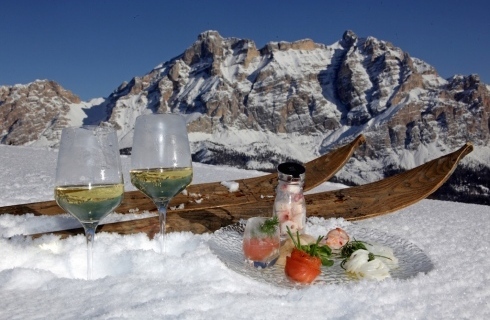 Alta Badia plays host to an annual Wine Ski Safari every March, enabling wine connoisseurs to ski around the region while sampling different wines. It’s perhaps best not to try too much wine while skiing, though! Alta Badia is an attractive ski destination that not only has lots of great slopes, but also offers easy access to the rest of the Dolomiti Superski area for even more skiing. The Alta Badia region is known for its well-groomed runs and fast and plentiful lifts, along with a good mix of slopes for both beginners and more experienced skiers. There are five villages that form focal points for their respective ski areas: Corvara, Colfosco, La Villa, San Cassiano, Badia and La Val. Corvara occupies a prime spot on the famous Sella Ronda and is also where the first ski school in Alta Badia was built back in the 1930s. While there are plenty of blue and red runs to enjoy, expert skiers will want to try the Vallon-Boè and Col Alt runs for a real challenge. Colfosco is particularly ideal for families and those wanting to go on an unforgettable ski tour or two. One must-try ski tour travels to the Puez-Odle natural park and cuts through the beautiful Val Mezdi valley. La Villa is best known for the Gran Risa, the slope on which the World Cup giant slalom takes place each year, and offers more challenging skiing in a fantastic location. San Cassiano offers not just skiing, but also the Foram toboggan run, which runs downhill for 7.2 km from Lagazuoi to San Cassiano. Finally, Badia is particularly suitable for families thanks to the quiet village and the scenic ski runs on Mount Heilig Kreuz. If you also want to go cross-country skiing on your ski holiday in Alta Badia, there are 30 km of trails to explore for both classic and skating-style skiing.